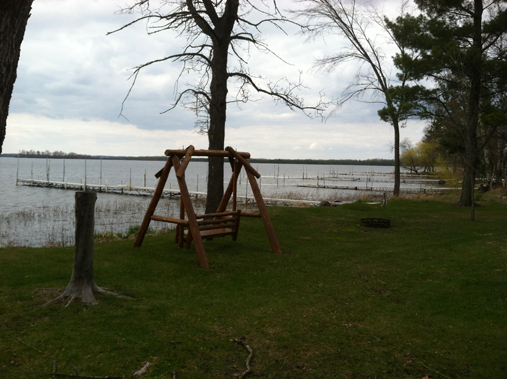 Docks are in the lake! Let’s go fishing!! I’m pretty sure I’m old now. It’s not the sagging skin around my chin or the frown line between my eyes that makes me certain. It’s the feeling I get this time of year when 3:00 rolls around and I’m desperate for an excuse to head to the house and rest my aching back. Spring cleaning and resort-opening projects are for the young-of-back, not the young-of-yester-year. Apparently Jay and I are firmly in the second group these days! In spite of our aches and pains it’s wonderful to see the resort coming together. We got docks in the lake yesterday and I accepted my role as not-the-boss with as much grace as I can manage. I really do hate when he’s in charge. However, getting docks in the lake lands firmly on his side of our work equation so I don’t get to be the Chief on days like yesterday. I considered staging a coup when he made me use the tape measure to make sure we had the dock EXACTLY 96 inches from where the dock ramp lands on shore but I let it go. The man is a perfectionist and (normally) I love that aspect of his personality. After all, it makes him easy to tease! Jay loves it when we have to rent the Bobcat to put docks in the lake. For those of you who own your own boat there are new rules in effect for you this year. In an effort to suppress the spread of invasive species through public education the Minnesota DNR will require you to display in your boat an aquatic invasive species decal. The rule says that all boats launched on Minnesota waters must have the decal displayed. This rule does apply to out-of-state boats, too. We will have decals here at Wildwood this summer if you haven’t managed to pick one up before coming up for vacation. 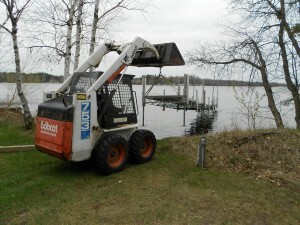 Here is more info on the rules from the DNR website: http://www.dnr.state.mn.us/invasives/aquatic_qa.html. Have you planned your early season fishing trip? 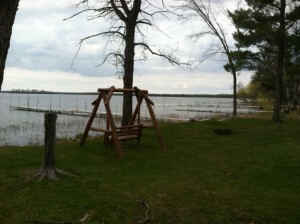 Maybe you are thinking of a Memorial Weekend get-away? We still have some Memorial Day openings as well as some great June weeks open. You can check out our availability on our website at: http://wildwoodresort.net/VacationMaster/vm.html. We would love to talk with you about our summer openings!